The District shall provide homeless students with access to education and other services necessary for these students to meet the same challenging academic standards as other students without segregation or stigmatization. Enrollment Homeless youth have the right to immediate enrollment in their school of origin or school where they are currently residing without: proof of residency, immunization records or tuberculosis skin-test results, school records, or legal guardianship papers. 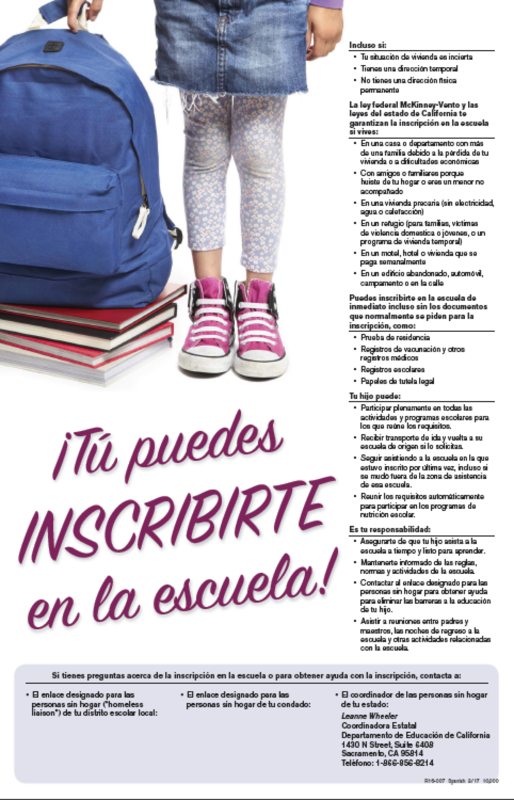 They automatically qualify for nutrition programs, and transportation services. Placement decisions for homeless students are based on the student's best interest as defined in law and administrative regulation. In determining a student's best interest, a homeless student shall, to the extent feasible, be placed in his/her school of origin (the school that the student attended when permanently housed or the school in which the student was last enrolled) or to the school in the attendance area where he/she is currently living unless his/her parent/guardian requests otherwise. The student may continue attending his/her school of origin for the duration of the homelessness and until the end of any academic year in which he/she moves into permanent housing. If a dispute arises over school selection or enrollment in a particular school, the student shall be immediately admitted to the school of origin (the school that the student attended when permanently housed or the school in which the student was last enrolled) or to the school in the attendance area where he/she is currently living. The parent/guardian shall be provided with a written explanation of the placement decision, including an explanation of the parent/guardian's right to appeal the decision and will be referred to the District homeless liaison that can be reached at the district office at 562- 907-5931. Any school you attended in the last 15 months that you feel connected to. Your school district must work with you, your education rights holder,* your caregiver, and your social worker/probation officer to develop a plan to transport you to your school of origin. If you are transitioning from elementary school to middle school or from middle school to high school, you have the right to transition to the same school as your classmates. If there is any disagreement about which school you will attend, you have the right to stay in your school of origin until the disagreement is resolved. You have the right to immediately enroll in your regular home school after you move placements. You cannot be forced to attend a continuation school or other alternative education program, such as independent study, even if you are behind in credits or have discipline problems at school. 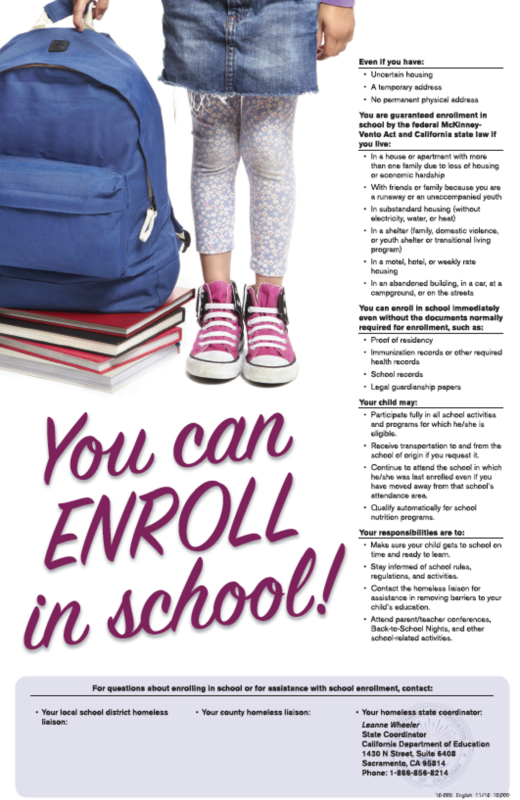 You have a right to immediately enroll in school and begin attending classes, even if you do not have the paperwork you would normally need for enrollment (such as birth certificate, transcript, or IEP) or you did not check-out from your previous school. Your previous school must send your education records to your new school after you enroll. You have the right to participate in any activities available at your new school, such as sports teams, tutoring, or after-school clubs, even if you miss a tryout or sign-up deadline. If you change schools during the school year, you have a right to partial credits in all classes that you are passing when you leave your old school, even if you do not complete the entire class. After you change schools, your new school must accept the partial credits issued by your old school. After you change schools, you have the right to be enrolled in the same or similar classes you were enrolled in at your last school. You cannot be forced to retake a class or part of a class that you have already completed with a passing grade, if it would make you off-track for high school graduation. You have the right to take or retake any class that you need to go to a California State University or University of California. Your grade cannot be lowered because you were absent from school for a court hearing, placement change, or a court-related activity. You have the right to stay in high school for a fifth year to complete your school district graduation requirements, even if you are over 18. If you are behind on your credits, and you transferred schools after 10th grade, you may be eligible to graduate under AB 167/216 by completing only the state graduation requirements (130 credits in specific classes) instead of your school district’s requirements. If you are eligible, the decision of whether to graduate under AB 167/216 is made by your education rights holder. You have the right to have the application fee waived when you apply to a community college in California. You have the right to receive the maximum amount of federal student aid and you may be eligible for up to $5,000 per year from the Chafee scholarship. You cannot be suspended for more than 5 school days in a row or for more than 20 days in a school year. You have a right to be told why you are being suspended and the right to provide your version of events and evidence before you are suspended, unless there is an emergency. If the behavior for which you are being suspended could subject you to criminal charges, you should consult with your education rights holder or attorney before providing an oral or written statement to the school or police. Your attorney and social worker must be invited to a meeting before your suspension can be extended beyond 5 days and a suspension can only be extended if you are being considered for expulsion. You have a right to a formal hearing, and to be represented by an attorney at that hearing, before you are expelled. If you are facing a possible expulsion, your attorney and social worker must be notified. If you are in special education, your attorney and social worker must be invited to a meeting to decide whether your behavior was related to your disability. You have the right to access your school records if you are16 years or older or have finished 10th grade. Your social worker/probation officer and education rights holder can access your school records as well. In an effort to ensure stable school placements in the best interest of the child, please contact the District foster care liaison, Lorena Duran, at 562-907-5931. To reach the District Foster and Homeless Liaison, Lorena Duran, please call (562) 907-5931 or email lduran@ewcsd.org.